Online ordering menu for GILIBERTOS no.2. 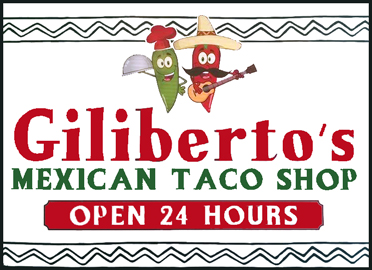 Here at Giliberto's, we serve tacos, burritos, nachos, and more! Breakfast is served here 24 hours a day. Our specials include the Burritos Supreme, Super Nachos, and Taco Salad. We also have Vegetarian and Seafood dishes. Our food is made fresh daily. Find us at the corner of 10th Street and Bahnson Ave. We are east of I-229, and near Kenny Anderson Park and Washington High School. Order online for carryout!